Sold by The Amazing Express and Fulfilled by Amazon. Gift-wrap available. Comment: FREE Shipping! Discs and Case have minor shelfwear. No Hassle Return Policy. Amazon's Choice for "generation iron"
Sold by The Amazing Express and ships from Amazon Fulfillment. Sold by Serenity-Now and ships from Amazon Fulfillment. Not since the classic PUMPING IRON has a film captured all the passion, pain and power behind the world of competitive bodybuilding. Academy Award® nominee Mickey Rourke narrates the illuminating (New York Daily News) and gorgeous (Village Voice) documentary about seven rivals Phil Heath, Kai Greene, Branch Warren, Dennis Wolf, Victor Martinez, Ben Pakulski, Hidetada Yamagishi and Roelly Winklaar as they battle for the title of Mr. Olympia. But beyond the gym, the stage, and the misconceptions about the sport, how far will each of them go to achieve the ultimate in extreme physical perfection? Experience this fascinating (Washington Post) true story of discipline, defeat, redemption and triumph, featuring special appearances by Michael Jai White, Lou Ferrigno and many others! 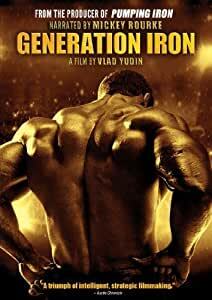 The movie has the feel of the original Pumping Iron somewhat, taking you a little further into the lives of the bodybuilders, showing them at home, with families, etc. Not all the bodybuilders had the feel though. Some of them are just too arrogant and cocky to enjoy listening too, while others like Kai Greene have a touch of the old school more humble attitude that not only endears them to the viewer but sets them apart from the others. I was very disappointed however that they didn't delve more into supplements and steroid usage, as obviously it plays a huge role, but all in all the movie kept me focused on it for the full two hours up until the title competition which really was well filmed in such a way as to put you on the edge of your seat (assuming you didn't already know the outcome which I did not going in). I wished it had been a little longer and focused more on training, steroids and supplements and their role in the title but overall the movie outshines some of these documentary's on bodybuilding and was well worth the 14 bucks to buy. Its a re-watcher. By the way, be sure to watch the closing credits all the way to the end. The scene of Mike Katz still looking for his T-shirt (that Ken Waller hid from him at the South Africa Mr Universe in the original Pumping Iron) is a priceless moment of memorabilia for us old schoolers out there. This documentary was ridiculously good. I enjoyed learning about the struggles and preparation these athletes encounter just preparing for the Mr. and Ms. Olympias. There is also a section on the steroid use. The competition is fierce between Kai and Phil as they battle for the top dog position. I was especially moved by the story of Kai Greene and his artwork. 5.0 out of 5 starsStop comparing this to Pumping Iron! This is centered around the Mr. Olympia contest and what it takes to get there. As a huge fan of the sport, there really is no surprises here except for the portrayal of Phil Health. I don't know if he's acting insecure for the cameras but he comes off as being quite the jerk. The additional footage of Dennis Wolf was really interesting as I didn't know much about him. Kai Greene is well Kai in this. Kai comes off as articulate as usual and really is the true ambassador for the sport. Wish they would've mentioned more of his paintings but that's a minor detail. Overall the tone of the documentary is darker and won't leave you with a happy go lucky attitude but it just might inspire you. 5.0 out of 5 starsIncredible, powerful documentary. I wanted to watch this doc for a while after following Kai Greene on Instagram and becoming a huge fan of his work ethic, artistry, and determination. Totally blown away. What a moving, thoughtful look at the lives of men who are either championed or vilified/ridiculed - there is simply no in between in how bodybuilders are perceived. They became so human...so vulnerable and real, I couldn't help but appreciate the level of effort and sacrifices made to manipulate their bodies to this level of perfection and mass. I'm not a bodybuilder myself (I do love lifting, though), but I think even non-fitness types will appreciate the documentary and the stories of these men. Mickey Rourke's narration was great...perfectly cast voice. Good docu, just lacked any in-depth information -- I mean details around diet, routines, exercise, techniques, supplements, etc... I know we watch these movies for the spectacle, but I also think there is a high likelyhood that the people watching this movie are likely gym-goers themselves and wouldn't mind some interesting information tidbits from these pros... and there is none of that. This is really a human story about people working hard to be at the top of their game with some minor story arcs thrown in... that's fine, just not riveting/mind-blowing. 3.0 out of 5 starsWorth a rental. It wasn't as good as I hoped. But for the price, it's worth a watch. I wish I rented it instead of purchasing it. Oh well. The body builders are amazing. Their dedication and hard work really shows. I just think the film itself was a little drawn out and never really got me super excited about anything. It was kind of flat and never reached a high point. The Male perspective of Bodybuilding. I appreciate that the men being interviewed in this movie are honest of themselves about their activities such as food, workouts, and competitions. These guys are inspiring future generations to appreciate bodybuilding and better ways of training. Talk about screwing up a great subject, such great caste. Maybe I am comparing it to Pumping Iron and that is not fair but a documentary should take us INTO the life of the competitor(s). This doc had quick flashes of them eating, training and posing, like a giant commercial. You did not get a sense that you were there with the competitors in their everyday life. Hard to explain but I was expecting so much more. They should have chosen less bodybuilders and focused more on each of them. USA docs can learn so much from BBC docs (Pumping Iron was the exception).